Finally on Monday I had my chance to shoot birds. 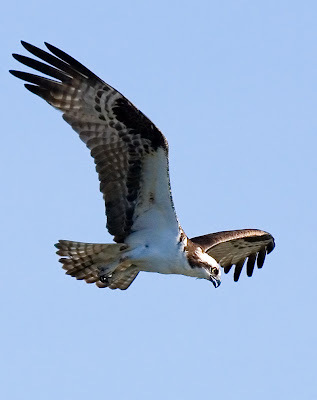 We drove to Rodman Slough near Clear Lake and I had hoped to see Osprey and possibly eagles. Unfortunately most of the birds had already left, but there were a couple of Osprey flying around 'fishing'. I still needed more reach than the 5D could offer, but the results aren't too bad considering I was using a 2x TC and handholding. Technical Specs: Canon 5D, 300mm f/2.8 IS + 2x TC (600mm equiv. ), f/6.3, 1/4000s, ISO 800.